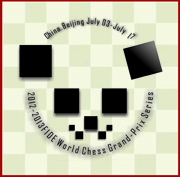 On July 16th the closing ceremony of FIDE Grand Prix in Beijing took place in the New Century Grand Hotel. The winners of the tournament were awarded with cups. FIDE President Kirsan Ilyumzhinov expressed his gratitude to the organizers and all who made this Grand Prix possible. He also congratulated Shakhriyar Mamedyarov on his victory. “I wish Shakhriyar to continue his winning way and to bring joy to all his fans all around the world.” After short speeches players and guests enjoyed food and wine. Find the photos from the closing ceremony in the photo gallery. Shakhriyar Mamedyarov made a draw against Boris Gelfand in the last round of Grand Prix in Beijing and claim clear first place with 7 points. In the other key game Alexander Grischuk could not break through against Peter Leko and the game also finished peacefully. As a result, Grischuk is placed second half a point behind of the winner. Veselin Topalov and Peter Leko shared the third place with +1. The victory over Alexander Morozevich was important for the former world champion, as it gave him clear first place in overall Grand Prix series. The games Ivanchuk-Karjakin, Wang Yue-Giri finished in a draw. Wang Hao defeated Gata Kamsky. In the 10th round of Grand Prix in Beijing four games were decisive. The leader of tournament Shakhriyar Mamedyarov was defeated by Alexander Morozevich. His nearest rival Alexander Grischuk also lost against Boris Gelfand, and, as a result, both Mamedyarov and Grischuk keep their first and second places. Alexander Morozevich and Peter Leko share the third place. After yesterday’s drama the luck came back to Anish Giri and he won against Veselin Topalov. Vassily Ivanchuk got promising position against Gata Kamsky but unexpectedly lost. Two Chinese players Wang Hao and Wang Yue drew against Peter Leko and Sergey Karjakin respectively. The last round will start at 1 p.m. local time. The closing ceremony will be at 8 p.m. at the New Century Grand Hotel. Two decisive games in round 8. Mamedyarov and Grischuk continue leading.